The case for not cutting off aid to Pakistan. Within minutes of last Sunday’s announcement that the United States had killed Osama bin Laden at his conspicuous compound in Pakistan, accusations regarding the role played by his adopted country-of-residence began to fly. Had Pakistan’s notorious intelligence service (the ISI) known about bin Laden’s whereabouts all along? Or was a glaring oversight simply a sign of the agency’s incompetence? And, in either case, was the United States’ generous military and economic aid to Pakistan—ostensibly bestowed in exchange for cooperation in the war on terror—really worth it? Members of Congress are right to question Pakistan’s actions—the bin Laden case, whether intentional or an oversight, is neither the first nor likely the last time the country has jeopardized U.S. interests—but they are reacting hastily in their calls to cut off aid to Pakistan. The Obama administration, which rightly realizes the extent to which Pakistan’s domestic and foreign policy issues are intertwined, has thus far employed a sophisticated mixture of high-level diplomacy and aid in the country with an emphasis on prodding the Pakistani military to disrupt terrorist networks while, at the same time, looking to constrain the military’s considerable political power. This policy of bestowing aid with specific conditions has helped keep the army’s autocratic impulses in check. Now, if the funds falter, so too might Pakistan’s still wobbly democratic foundation, creating a situation that would further threaten the security of the country and the region as a whole. Pakistan came into being as an insecure state, with contested borders on all sides. The army has molded these insecurities into a national narrative that places itself as the guardian of the state, the people and, since the 1970s, Islam. In practice, this means that the military is continually looking to expand its own capacity in order to compete with India and demonstrate strength along its other borders. It also means that the Pakistani army relies significantly on allies—most critically these days, the United States—for aid and assistance to pursue its core national security goals. Finally, it has meant that the army has shown little hesitation to intervene politically when it considers it necessary to fulfill its role as the nation’s guardian. The United States, for its part, has historically allied itself with military dictators in Pakistan to protect and promote its strategic interests in the region. Such ties cooled briefly in the 1990s, after evidence of the country’s clandestine nuclear weapons program came to light. 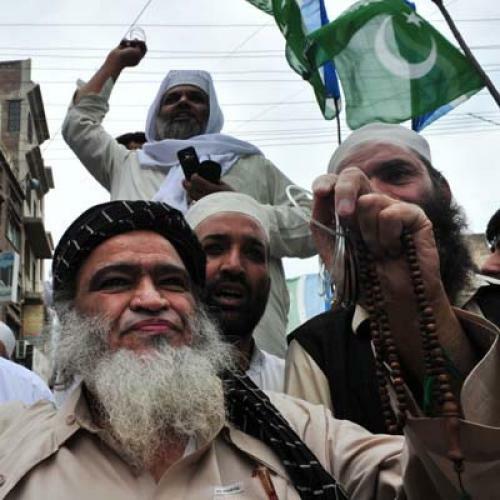 But, after a decade of U.S. sanctions and minimal diplomatic relations, the September 11 attacks brought the two states together again when Pakistan’s then-military dictator, Pervez Musharraf, committed his security forces to the task of pursuing and eliminating the extensive Al Qaeda network operating within Pakistan’s borders. As a result, from 2001 to 2008, Pakistan received almost $8 billion in military assistance from the United States. But, while the Bush administration showered the Musharraf regime with aid in exchange for cooperation against Al Qaeda, it did little to push for political reform or meaningful investments in Pakistani civil society. In his testimony before the Senate Foreign Relations committee in 2009, Steve Coll, president of the New America Foundation, lamented the United States’ failure to “invest deeply and broadly in Pakistani society” and its tendency to treat the Pakistani regime like a hired “sheriff” instead. Despite all the assistance provided by the U.S. government, by 2007, Al Qaeda was still running its base of operations out of Pakistan. Violence and terrorism overran large swathes of the country, including its capital city, where clerics of the Red Mosque threatened direct revolutionary action against the state. At this point, it finally became clear to many policymakers in Washington that the provision of aid to the military dictatorship, without conditioning it upon specific actions and reforms or pushing for any democratic institution-building, had allowed the Pakistani army to pursue its own interests without addressing any of the country’s root causes of extremism. Senators Joe Biden and John Kerry advocated for a re-evaluation of U.S. assistance to the country. Biden called for increasing non-security aid to help bolster the state’s political institutions, as well as conditioning security aid on both performance in the military’s war on terror and the security apparatus in Pakistan allowing democratic political institutions to take shape. Creating credible representative institutions that could supervise the actions of the army began to be seen as a key element in stabilizing Pakistan and ensuring that the U.S. had a more reliable, durable partner. As a result, when Musharraf—facing widespread civil unrest due to a number of unpopular moves by his regime, including the ouster of the chief justice of the country’s supreme court—suspended the constitution and declared a state of emergency in November 2007, U.S. Secretary of State Condoleezza Rice reacted by speaking openly about the possibility of limiting aid to Pakistan unless Musharraf relinquished his hold on the simultaneous offices of president and chief of army staff. A few weeks later, the dictator committed to removing his uniform and announcing general democratic elections. While the causes of Musharraf’s about-face were manifold, few doubted that the leverage exerted by United States’ threat to withhold foreign assistance had not been a critical factor. The reformulated U.S. aid package was greeted with much hostility by the Pakistani military establishment, as well as those who genuinely subscribed to the national security narrative that had been created over time. The army, supported by a coalition of political actors seeking to discredit the government that had accepted the United States’ new conditions, declared the package an unacceptable intrusion into Pakistan’s sovereign affairs and a risk to national security. But the eventual acceptance of the terms underscored the ever-growing importance of foreign military assistance to the Pakistani army. Such assistance has grown even more important in the last few years, as the Pakistani army has found itself greatly overextended in its effort to protect its eastern border with India while simultaneously battling a host of Islamist insurgent groups in its western tribal areas and the Swat Valley. After waging war—at the United States’ insistence—with some of the Islamist groups it had previously nurtured and considered allies, the army now felt it had no choice but to double down in its efforts at securing U.S. assistance. With the help of the United States, Pakistan’s current democratic government has successfully weathered many crises in the last two years. Indeed, the conditions placed on U.S. aid to Pakistan, alongside other forms of diplomatic pressure, have almost certainly helped to ensure that the army continues to abjure direct intervention in political affairs. For instance, many assumed that the army would use the aftermath of the country’s devastating 2010 floods as a pretext to take power, but Richard Holbrooke, then the Obama administration’s former special adviser on Afghanistan and Pakistan, made it clear that the U.S. would not tolerate any government but a civilian one. And, when diplomatic cables from WikiLeaks revealed that Pakistan’s head of the army, General Ashfaq Kayani, had contemplated ousting the country’s democratically elected government, the Pakistani army quickly pledged its support for the current democratic government in an effort to diffuse tensions. Now, the United States is faced with a choice. In the wake of the raid on bin Laden’s compound, Congress could decide to withhold U.S. assistance to Pakistan and subsequently find itself unable to use this proven leverage to continue bolstering the country’s weak, three-year-old democratic institutions against future military adventurism, at a time when its help may be needed more than ever. The collapse of Pakistan’s democratic government, in turn, would likely create regional turmoil by shaking up the country’s tenuous détente with its neighbors, Afghanistan and India, and provide an opening for Islamic extremists to mount a popular challenge to the legitimacy of the state. Or, having publicly called into question the Pakistani army’s credibility and integrity, the U.S. could use this unique moment to compel the military to take more serious action against terrorism, while at the same time promoting continued democratic growth. The U.S. cannot be certain that the Pakistani army won’t at times play a double game, but this isn’t the moment to sacrifice much-needed leverage in a country so vital to the security of South Asia—and the United States. Now is not the time to cut off aid to Pakistan. Dania Khan is a graduate student at the Fletcher School of Law and Diplomacy, where she studies international and human security in Southwest Asia. Yasser Kureshi is a law student currently pursuing a JD at the Boston University School of Law. They are both originally from Karachi, Pakistan.